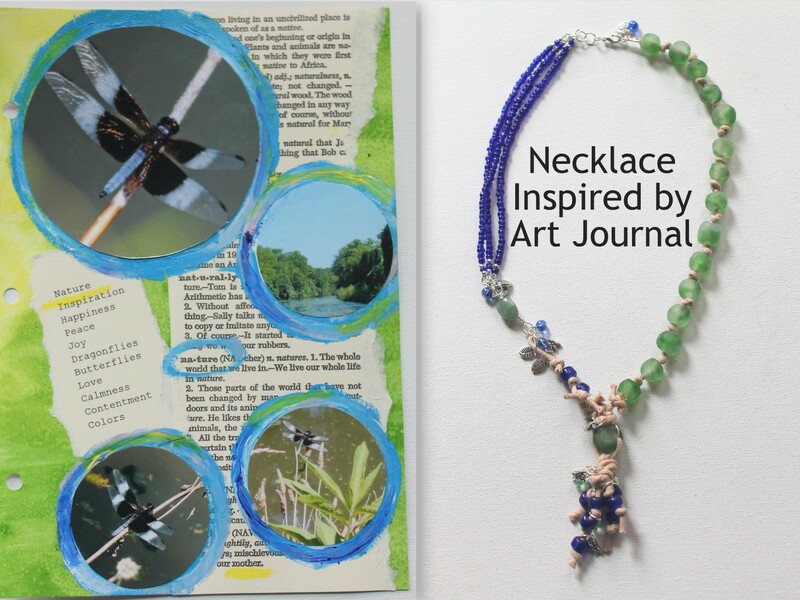 Friday I shared a recent art journal page inspired by nature and this week I have been sharing the necklace I made inspired by the page. 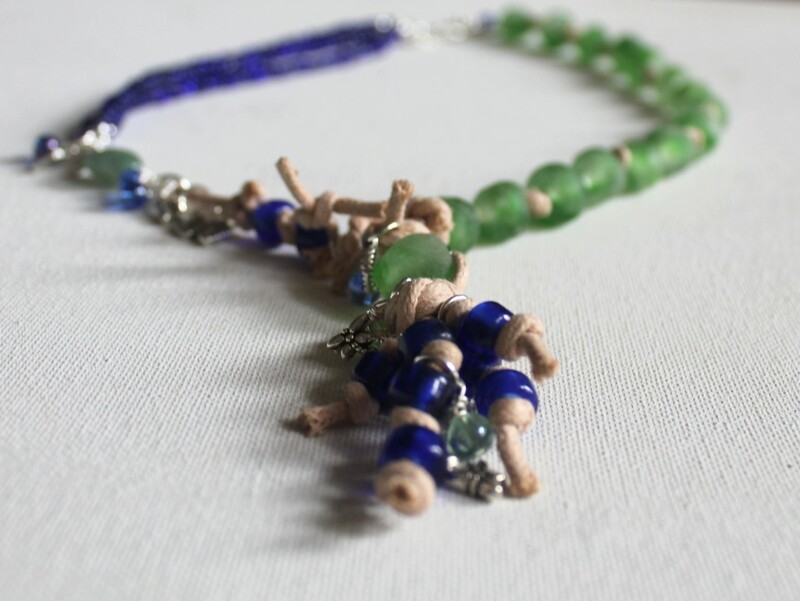 I also did a video tutorial on how to make the mixed media knotted bead that’s the focus of the necklace. So how did I go from this page . . . I made a kind of a list or map of the art journal page and then how I could translate that into jewelry. 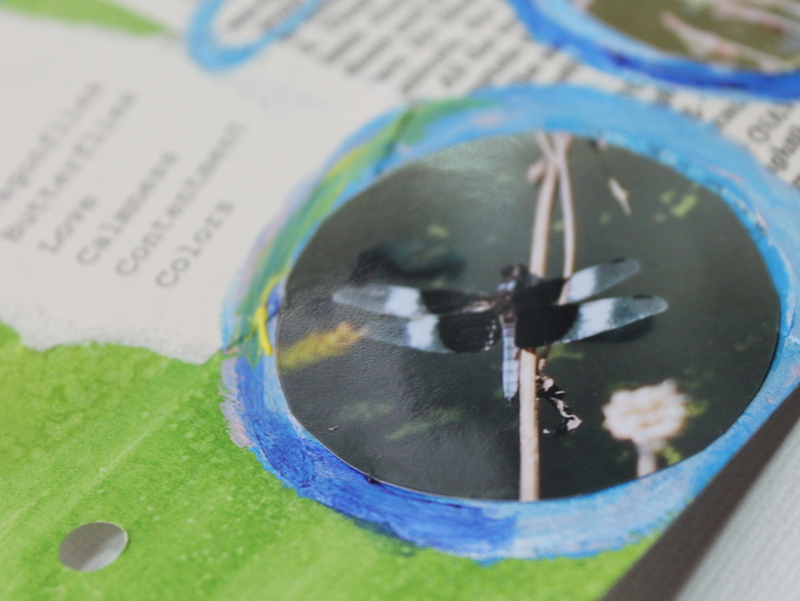 I listed out images, word combinations, colors and textures, feelings and mixed media materials. Then I took that list and gathered up my materials and made the necklace. For example, I listed the colors blue, black, green yellow and tan. I didn’t end up using the black or yellow, but the green, blue and tan play important roles. The blue symbolizes the water as well as the blue in the dragonflies and the green represents the greenery as well as mimicking the background color. 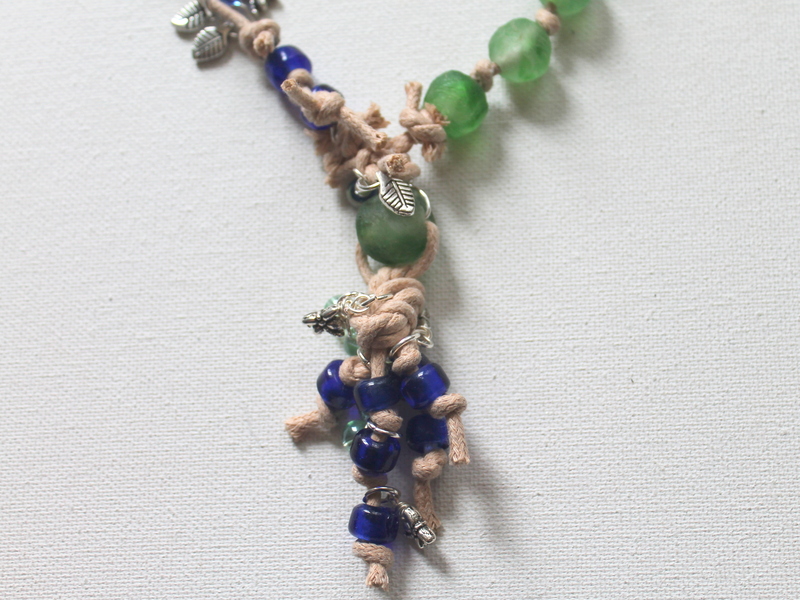 I wanted to use organic beads (the recycled glass green beads) and other organic materials. I used natural cotton cord as a major part of the necklace as well as the focal mixed media knotted bead. I also added some leaf charms to add more nature to the necklace. I think the result is an organic, nature inspired necklace that reminds me of the art journal page. I’m working on a new eCourse that will take you through this process more precisely and will include prompts and lots of examples and instructions on how to not only be inspired, but create an art journal and then create jewelry pieces inspired by your art journal pages. This entry was posted in Art Journal and tagged art journal, creativity, inspiration, jewelry design inspiration, nature, Nature Inspired Necklace, necklace by Kimberlie. Bookmark the permalink.